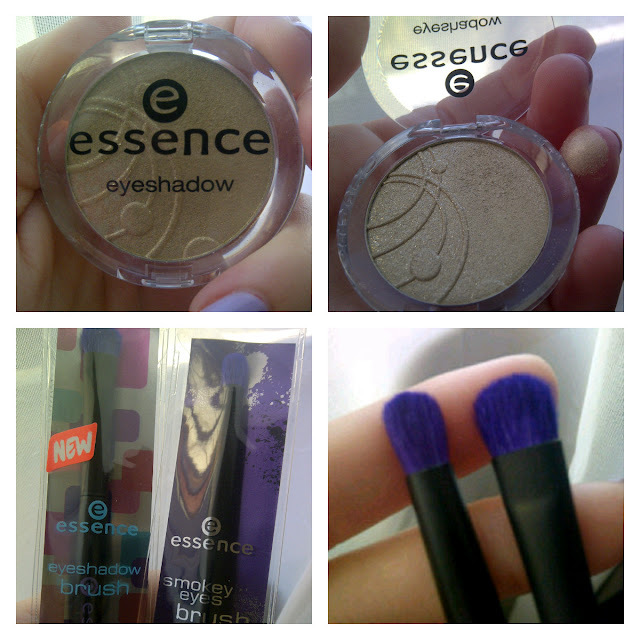 Essence Mono Eyeshadow and Eyeshadow Brushes / Gee Whiskers! Recently I have been experimenting more and more with Essence products because they are so affordable and have a large variety of products to try out. I recently bought myself a mono eyeshadow and 2 brushes. Essence Mono Eyeshadow in Dance All Night. As with the Quattro eyeshadow palette I reviewed a while ago (view post here), this eyeshadow is great quality and has a fantastic colour playoff on the eyelids. I wanted something to use as a highlighter for my brow bones and corner of my eyes and this shadow works perfectly because it is subtle but at the same time it can be built up easily to achieve the desired colour. What is also great is that the shimmer is not overly glittery which gives a more natural glow. You can expect this eyeshadow to last well on your lids throughout the day, if you don't touch and rub your eyes. The shadow can be easily removed with makeup remover or with your daily cleanser. I purchased a traditional eyeshadow brush and smokey eyes brush. These brushes cost only R19.99 each and therefore my expectations for them weren't exactly high. I mainly bought them because I loved the purple bristles and the design of the brushes appealed to me - Black handles with purple print (can you tell that I love purple yet!) Both brushes seriously surprised me! The bristles are soft and pick up product very easily but the best part is that they actually transfer the powder when you apply the shadow to your lids. A lot of brushes I have tried in the past (that costs me a lot more money), did not transfer the eyeshadow to my lids as effectively at these do. The brush fibres are sturdy enough to apply the shadow with precision but also have some play in them to allow you to easily blend the eyeshadows on your lids. All in all, these are fantastic and personally I can't wait to go buy the other brushes in the collection! These products cost me under R70 at Dischem which makes me love the Essence brand even more. Essence products are available at Clicks and Dischem stores. Follow Essence on Facebook and Twitter or visit their website. PS. I loved these products so much that I went back to Dischem and bought extras for the 6 month giveaway happening next week! I love essence products too.The pigmentation is amazing too.You should try their angled liner brush. Its very firm and gives a really precise line. It works a lot better than most other brands I've tried which were a lot more expensive. I also love essences eyeshadows. They are so affordable and can wear it in the day and at night. It lasts long o the eyes and looks great.